Fine minus unread copy with touch of wear at spine ends, in a Near Fine jacket with light edge and corner wear. This copy is apparently a bound, galley proof as per laid-in letter to "Bookseller" from Scribner’s editor. This copy inscribed - To Elaine, with best wishes – and signed and dated October 6, 1989 by the author on the title page. 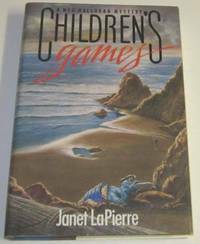 LaPierre’s second mystery Meg Halloran mystery set in northern California. Elaine and Joe Livermore were owners of Tucson's first mystery bookstore, Footprints of a Gigantic Hound.